I first saw a Travelscoot in the summer of 2010. Straight away I knew it was going to be the ideal solution for me. By then multiple sclerosis had limited my walking to the extent that I struggled to walk more than a mile. Up until then I had managed with a manual wheelchair but I had so much less independence. The idea of a mobility scooter had not entered my head until I saw the Travelscoot. Here are a few reasons why I enjoy my Travelscoot so much plus a few other thoughts. The design of the Travelscoot is novel as well as being very practical and it is fun to ride. I am still waiting to see another suitable mobility scooter that compares to the Travelscoot. In our house the Travelscoot is affectionally called The Trike. I can easily put my walking sticks at the front. That is both practical and convenient. Why hasn’t anyone else thought of this? It fits into the back of a London black cab, no need to fold it up. When the cab driver picks it up there is a look of incredulity because it is so light. The little red caddy in the ‘A’ frame is an ideal space for the shopping. It is so easy and convenient. If I am going away on holiday I can fit a small piece of luggage into the space. I have lost count of the number of people who have said “That looks as if it is great fun to ride”. I have to agree with them. It is very easy to lift the frame when it is folded up. The frame only weighs about 17 kilo. The central steering column folds down and use the bar to lift up the trike. It is very easy to find balance point and lift with only one hand. People see me on the street, we stop and have a chat. I’m sitting down they are standing up but they see me and do not see the mobility scooter. The bell that it comes with is puny and pathetic; I would replaced it with a decent bicycle bell. Find a way to show that the permanent brakes are applied. It is possible to drive the Trike when these are ‘on’ and quite soon they are totally ineffective. Supply a tool to use when adjusting the brakes. I have to use pliers they are very fiddly and inefficient. It is essential to be able to lift a leg about 30 cm off the ground. You need to have a good strong grip so that you can apply the brakes and turn the throttle. Folding it up and unfolding it is a bit of a knack. A quick squirt of WD40 will help. I have not been paid to write this article, I have no connections with Travelscoot. In my opinion the Travelscoot is a fantastic piece of kit which has really changed my life for the better. I also meant to say I’ve only met one other person with one in person. She was a German woman and we bumped into each other on the top of Table Mountain in Cape Town! They are a bit like buses, see one and then you will see 2 or 3. Can you see why people love them? I loved my 7 year old Travelscoot and showed it of to prospective customers many times. I don`t need it now so was being used by my husband after a stroke. The battery is at the end of its life so we decided to buy instead a new Kymco lite which was more suitable to our circumstances now. I did think I could sell my old one for spares , has anyone any idea of how to do this? Just add to this conversation, I’ve had my travelscoot for about 3 years and absolutely love it. I was on holiday in Australia over Easter and because Qatar airlines wouldn’t let me take Li-ion battery I had to find something to rent. Luckily I found a mobility shop close to where we were staying which was run by the person who created the Supascoota. I loved it and if my stability gets worse in time, this is what I’ll replace my Travelscoot with. Very light, easy to fold and stable. My only little issues with it was slower than my travelscoot and when I wanted to freewheel the scooter (eg going back into the house, manoeuvring in a restaurant) I had to unlock a gear on the rear wheel. Not difficult, just fiddly. Otherwise a fabulous piece of kit and you can find stockists in the UK. Interesting you should write with these ideas. Just come back from Amsterdam, KLM were the carriers and numerous phone calls re the battery, all eventually OK. Going to Australia next year and it has never crossed my mind that some airlines might not accept it. We intend to stop off in Singapose for a couple of days so no Scooter will be a disaster. How did you arrange hire in Australia. Was it luck and do you have any helpful hints? Thats very useful io about the Blue Badge. Sounds as if it got a sort international recognition. Not flying out to Australia until September 2018, tickets not available until October this year. I will let you know how things workout for the trip. We will be based in Sydney. Is Australia good for people with mobility problems? We do not have any plans apart from seeing out son and his wife. They are comong over here for Christmas. Went to Sydney 2 years ago. Didn’t need my scooter then but from what I remember everybody was very helpful and central Sydney was very easy to navigate. Look online there are sites with advice for reduced mobility people re public transport on their city/state government pages. If anyone could help it would be appreciated . If you live in the Kent Surrey area then someone would like to try out a Travelscoot. If you can help please email Ryan Green the email address is He has had MS for 10 years and mobility is becoming an issue. Initially its top speed was abysmal. One of the changes I made was to add a small cycle computer, the sort that measures and displays speed and distance, and this told me I was only managing around 3 mph – a shock as my old, belt driven model was capable of nearly 7 mph. I contacted Tony Korn of Travelscoot ( in Washington State), who told me the maximum speed could be changed – it was programmed into the controller. With his help we increased the speed to a bit over 5 mph. Which is fine now I am used to it. I am impressed with the changes in this latest version of the Travelscoot. Firstly, not having to deal with the belt is a huge improvement. That was my main maintenance item – replacing the belt. I don’t know how often I had to do it, but it was probably twice a year. Also, the belt tended to attract all kinds of debris, and needed frequent cleaning, especially in autumn when the streets are clogged with leaves. It now features a reverse gear. I use it sometimes although, ironically, the wheel motor version can be propelled backwards by foot far more easily than the belt version. The improvement I most appreciate is the new brakes. I tried lots of wheezes to improve the belt drive brakes, but even after my best efforts they left a lot to be desired. The brakes on the new scooter work just fine. It is important that they be adjusted so as not to rub when in the off position – too much rubbing has an impact on battery life – but this is not too difficult to do. I also appreciate a couple of the smaller improvements. The control equipment on the handlebars is far more robust than the belt drive version. Its LED indicator / switch was fragile and broke more than once – I was able to repair it with superglue (which became part of my scooter maintenance kit). I expect the new version to withstand the kind of handling the scooter sees at airports a lot better. Something not advertised is the improvement in hill climbing. The wheel motor has an effectively lower gearing than the belt drive – which makes it slower but able to provide more torque. It is able to climb hills my belt driven scooter would baulk at. In fact, there are situations where my earlier scooter would stall, leaving the motor whining and not turning, but the new version gets wheel spin. Overall, the wheel motor version of the Travelscoot is a huge improvement over the belt driven version. If you love Travelscoots, this is a must. Thanks for the very detailed reply. I think your adventures with the Travelsccot are similar to mine in England. Replace theft with borrow by joyriders. Found but not quite the same, cannot extend the steering column to maximum length because now slightly bent. I am always been stopped by other people who want to admire it. The design is so different from anything else available in the UK. All in all the new model is a huge improvement. Changing the belt was a real painin the backside and brakes not were not that reliable. The Travelscoot ticks so many boxes. Its the little things like place for walking sticks at the front, the shopping caddy that make a big difference. At the end of the day it is my independence and that is what counts. Hi David I got really excited when I read you can increase the speed of the ts. The slow pace is a constant frustration to me. I absolutely love the scooter. It’s let me go on numerous holidays now and opened my world again. Is there an all terrain version? So I can get about my garden? No an all terrain version does not exist. It would need wheels with a much bigger diameter and the motor not to be in the read wheel. 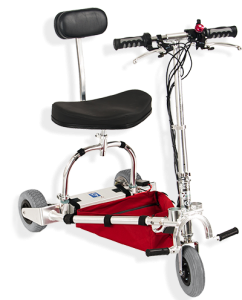 Have you thought about the Di Blasi mobility scooter. Takke a look on my websitwe. Use thew search bar. Its got big wheels but not too suer about stability on rough terrain. There was one for sale but do not know if it has been sold. Email questions to the owner even if it has gone. I was tempted to buy the Travelscoot and tested two of them. In the end. I bought a Supascooter. Three wheel like the Travelscooter. It. Folds up and is kept in the boot of my car. It. Cost £1400.00 including a Lithium Battery. It weighs 25 Kg without the. Battery. I am glad I chose the Supascooter as it does not have a seperate brake lever. It stops automatically when you release the throttle. I now have the freedom to go around the shops and museums. I take my Supascooter on the London buses (you must apply for a permit). I also go on the Metro buses in Surrey/Sussex (another permit). I am a Blue Badge London Guide. I am now conducting walking tours of London on my Mobility Scooter. Yes it is a nifty looking number, just looked it up on Youtube. The extra features such as automatic braking add an extra few Kg. I can see the attraction of some features that are unique to each scooter. As they say, each to their own. Incidentaly the whole matter of permits is odd. In 7 years a permit has been demanded 3 times nut bus companies never take it beyond that, never been inspected despite requests from me to their customer services. My travelscoot has given me a new lease of life, it looks cool and doesn’t say disabled. It’s fun to use, easy to dismantle if necessary and a boon to take on a plane or boat. Brilliant!!!!???????????????????? Agree with everything above its even made supermarket shopping fun! Do you feel it is stable ? I have recently had a nasty accident I’m my fold up scooter as it is obviously very unstable!! I have been out of action for a couple of months with 2 fractured iny pelvis!! It is as stable as a three wheeled bike. Just look out for adverse camber and pot holes. Y&es you do need to learn to ride it, in other words go round corners carefully and lean forward when going overe bumps. I too had a couple of tumbles in the early days. Thanks for this. Is there a UK supplier for Travelscoot, or do you have to get it from Germany ?